The emergence of resistance to antibiotics over the past few decades has created a state of crisis in the treatment of bacterial infections.Over the years, β-lactams were the antibiotics of choice for treatment of S. aureus infections. However, these agents faced obsolescence with the emergence of methicillin-resistant S. aureus (MRSA). Presently, vancomycin, daptomycin, linezolid, or ceftaroline are used for treatment of MRSA infections, although only linezolid can be dosed orally. Resistance to all four has emerged. Thus, new anti-MRSA antibiotics are sought, especially agents that are orally bioavailable. a new antibiotic (E)-3-(3-carboxyphenyl)-2-(4-cyanostyryl)quinazolin-4(3H)–one, with potent activity against S. aureus, including MRSA. We document that quinazolinones of our design are inhibitors of cell-wall biosynthesis in S. aureusand do so by binding to dd-transpeptidases involved in cross-linking of the cell wall. quinazolinones possess activity in vivo and are orally bioavailable. This antibiotic holds promise in treating difficult infections by MRSA. Journal of the American Chemical Society (2015), 137(5), 1738-1741. In the face of the clinical challenge posed by resistant bacteria, the present needs for novel classes of antibiotics are genuine. In silico docking and screening, followed by chemical synthesis of a library of quinazolinones, led to the discovery of (E)-3-(3-carboxyphenyl)-2-(4-cyanostyryl)quinazolin-4(3H)–one (compound 2) as an antibiotic effective in vivo against methicillin-resistant Staphylococcus aureus (MRSA). 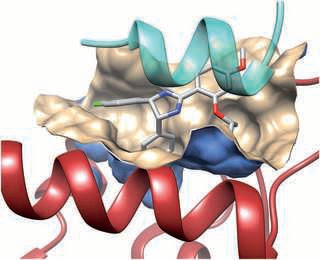 This antibiotic impairs cell-wall biosynthesis as documented by functional assays, showing binding of 2 to penicillin-binding protein (PBP) 2a. We document that the antibiotic also inhibits PBP1 of S. aureus, indicating a broad targeting of structurally similar PBPs by this antibiotic. This class of antibiotics holds promise in fighting MRSA infections. MRSA. Presently, vancomycin, daptomycin or linezolid are agents for treatment of MRSA infections, although only linezolid can be dosed orally. Resistance to all three has emerged. Thus, new anti-MRSA therapeutic strategies are needed, especially agents that are orally bioavailable. Staphylococcus aureus is responsible for a number of human diseases, including skin and soft tissue infections. Annually, 292,000 hospitalizations in the US are due to S. aureus infections, of which 126,000 are related to methicillin-resistant Staphylococcus aureus (MRSA), resulting in 19,000 deaths. A novel structural class of antibiotics has been discovered and is described herein. A lead compound in this class shows high in vitro potency against Gram-positive bacteria comparable to those of linezolid and superior to vancomycin (both considered gold standards) and shows excellent in vivo activity in mouse models of MRSA infection. The invention thus provides a novel class of ηοη-β-lactam antibiotics, the quinazolinones, which inhibit PBP2a by an unprecedented mechanism of targeting both its allosteric and active sites. This inhibition leads to the impairment of the formation of cell wall in living bacteria. The quinazolinones described herein are effective as anti-MRSA agents both in vitro and in vivo. Furthermore, they exhibit activity against other Gram-positive bacteria. 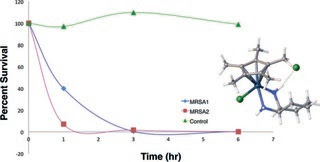 The quinazolinones have anti-MRSA activity by themselves. However, these compounds synergize with β-lactam antibiotics. The use of a combination of a quinazolinone with a β-lactam antibiotic can revive the clinical use of β-lactam antibacterial therapy in treatment of MRSA infections. The invention provides a new class of quinazolinone antibiotics, optionally in combination with other antibacterial agents, for the therapeutic treatment of methicillin- resistant Staphylococcus aureus and other bacteria. We recently reported on the discovery of a novel antibacterial (2) with a 4(3H)-quinazolinone core. This discovery was made by in silico screening of 1.2 million compounds for binding to a penicillin-binding protein and the subsequent demonstration of antibacterial activity againstStaphylococcus aureus. The first structure–activity relationship for this antibacterial scaffold is explored in this report with evaluation of 77 variants of the structural class. Eleven promising compounds were further evaluated for in vitro toxicity, pharmacokinetics, and efficacy in a mouse peritonitis model of infection, which led to the discovery of compound 27. This new quinazolinone has potent activity against methicillin-resistant (MRSA) strains, low clearance, oral bioavailability and shows efficacy in a mouse neutropenic thigh infection model. Bouley’s work, conducted under the advisement of Shahriar Mobashery, Navari Family Professor in Life Sciences, and Mayland Chang, Research Professor and Director of the Chemistry-Biochemistry-Biology Interface (CBBI) Program, centers around the discovery of a new class of antibiotics that are selective against staphylococcal species of bacteria, including hard-to-treat methicillin-resistant Staphylococcus aureus (MRSA). She has already identified a class of compounds that has in vitro activity against bacteria and demonstrated efficacy in mice. Bouley spent three months in 2012 in the laboratory of Prof. Juan Hermoso at Consejo Superior de Investigaciones Cientificas in Madrid, Spain, where she solved the crystal structure of the lead compound in complex with its target protein. 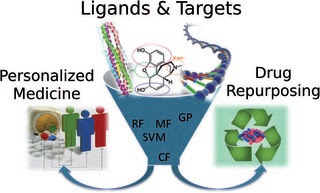 Her studies have shown an unprecedented mechanism of action that opens opportunities for clinical resurrection of β-lactam antibiotics in combination with the new antibiotics. Bouley’s work during her fellowship tenure will explore structural analogs of these compounds with the goal of optimizing their potency in vivo and improving their drug-like properties. Br J Biomed Sci. 2009;66(4):186-9. In vitro activity of Inula helenium against clinical Staphylococcus aureus strains including MRSA. O’Shea S, Lucey B, Cotter L.
Department of Biological Sciences, Cork Institute of Technology, Cork, Ireland.